Discover the meaning behind 28 objects commonly left at Day of the Dead altars in Jalisco, Mexico. 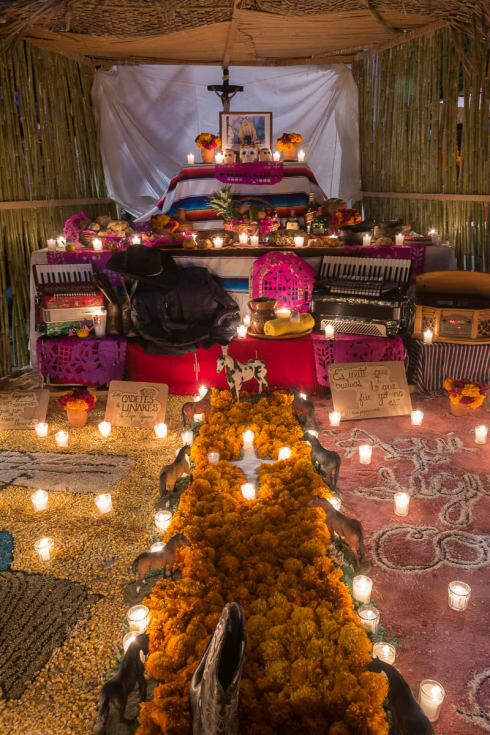 The Day of the Dead altar is at once mysterious and visually legible, a cultural touchstone whose multi-layered symbology can be decoded by a knowledgeable observer. The holiday’s indigenous, millennia-old origin has been transformed and molded by centuries of Catholic and regional influence: it’s not celebrated exactly the same in any two regions. But there is a commonality which ties everything together, especially when it comes time to build the altar. 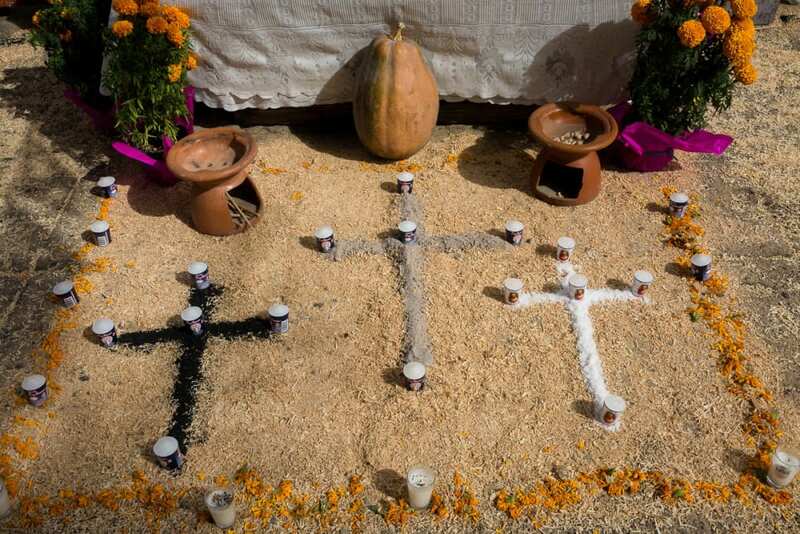 Video: Watch this short video slideshow of all 25 objects left on the Day of the Dead altar. 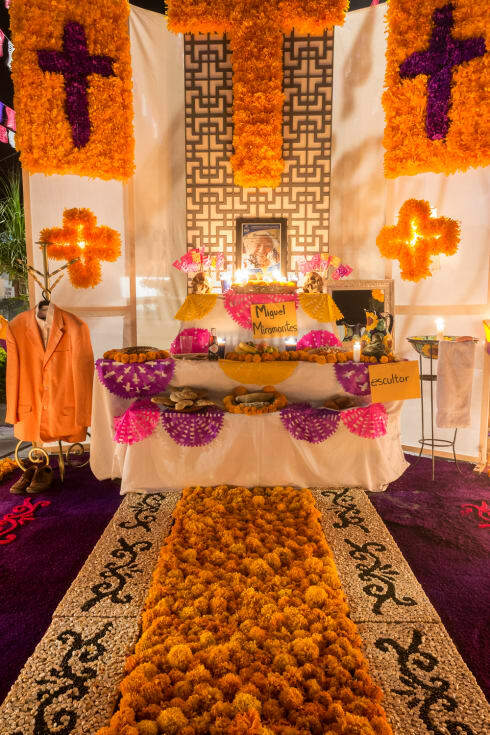 The ofrenda is constructed to help guide the spirits of family members back to the land of the living on the noche de muertos, the night of November 2. Incense, flowers, candles, clothes, and food are left out to lead the dead to the altar and their waiting families, who spend the night in the graveyard singing, playing music, drinking, and remembering. 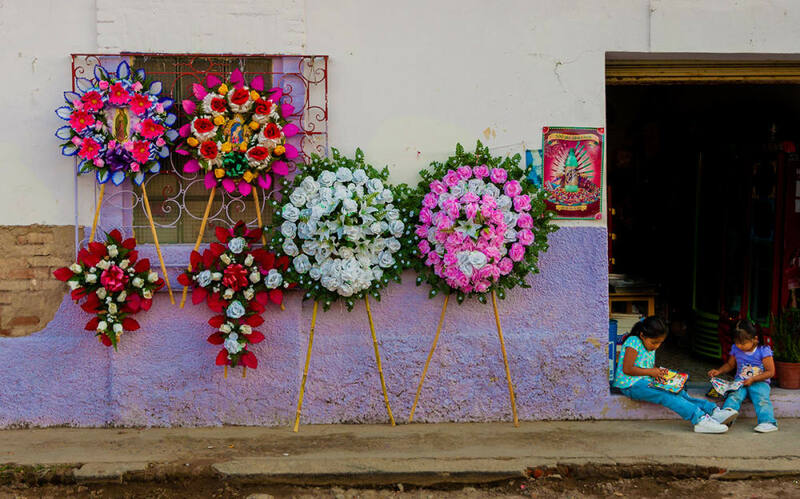 These photos of Day of the Dead altars were taken over seven years in Jalisco, Mexico, between 2010 and 2017. The Day of the Dead altar is usually built on multiple levels, with some extravagant, community-built versions reaching a story high. 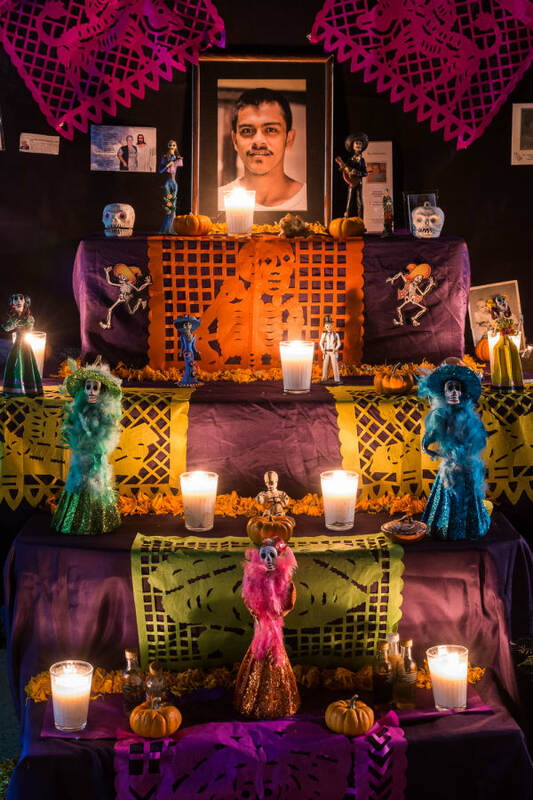 But the most common altars are divided into three sections: the ground-level entrance, a mid-tier section with a table of offerings, and the highest level representing heaven, where photos of the dead are hung alongside images of favorite saints, the Virgin of Guadalupe and Jesus. On November 2, the dead come back to visit the living, and the entrance of the ofrenda is built to welcome and guide them to their altars. 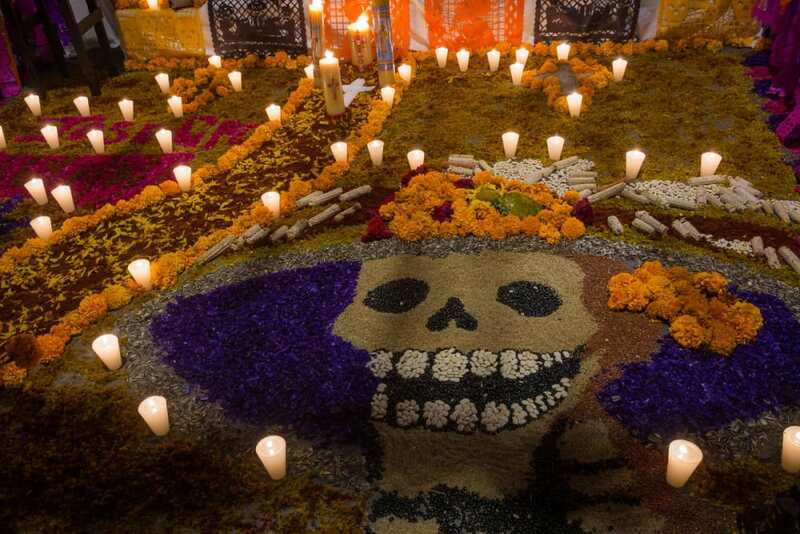 Common elements are laid, such as candles, skulls, seeds, a carpet of colorful sawdust, incense, and marigolds. This altar was built by Irma Esperanza Gomar Navarro for Lupe Tijerina, leader of Los Cadetes de los Linares, a famous Mexican band formed in 1960. He died in 2016 on stage while playing his accordion. This altar was made for Miguel Miramontes, one of Jalisco’s best-known sculptor’s, who died in 2015. Ixtlahuacán de los Membrillos, Jalisco. Once everything on the altar is in place and darkness is at hand, everyone begins lighting up the candles. As twilight fades away, and family and friends gather around, the flickering lights begin to fill the nooks and recesses of the displays with a warm glow, which helps guide the dead to their altar. Candles light up an altar in Chapala, Jalisco, for Humphrey Bogart and Santo Toribio Romo, a saint who protects migrants crossing the U.S. border. 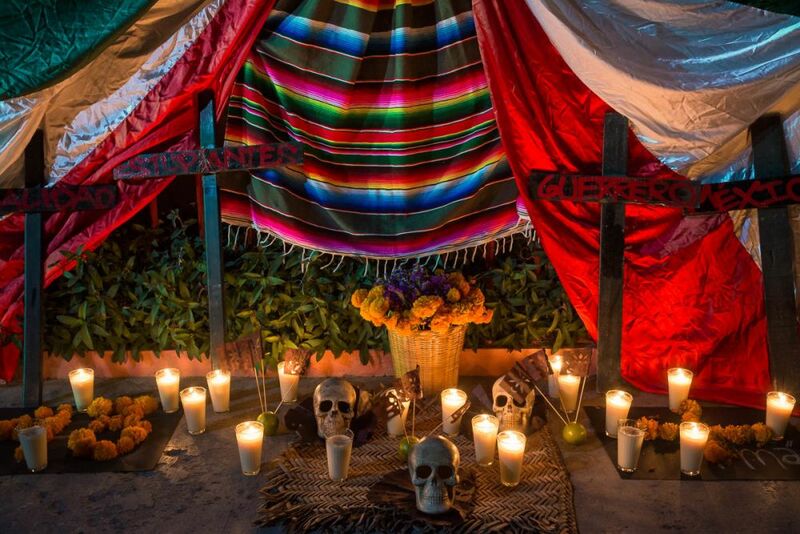 An altar in Ixtlahucán de los Membrillos, Jalisco, Mexico, lit by candles during the Day of the Dead. Placed alongside photos and possessions of the dead, the graphic and macabre representation of the human skull, free of its skin and facial features, stripped by decay to its common bony element, confronts the observer with her own mortality. One night years from now, her spirit will return to this family spot to be honored and remembered, too. The dark, hollow eyes of the skulls peer out from comforting glow of the altar, otherwise contrasting against the night’s overwhelmingly jovial atmosphere, which can reach the order of whimsy and humor, and at times might seem to border even on irreverence. A ceramic skull sits among candles and empty Corona bottles on la Noche de Muertos in Chapala, Jalisco. A sugar skull, created from formed sugar, on an altar in Chapala, Jalisco. Clay skulls on an altar in Ixtlahucán de los Membrillos, Jalisco. The brightly colored orange petals of the marigold are said to represent the sun. Along with its sweet, floral scents, which get carried along by the evening winds, the flowers lead the spirits to their shining altars. Parts of the Day of the Dead ofrenda are still relatively new additions to the centuries-old tradition. But aspects such as the marigold have found a vital place at the altar, going back to the holiday’s indigenous origins. Their blooms are used to line graves and adorn altars, sometimes laid down to create a physical path for the dead to follow to the ofrenda. 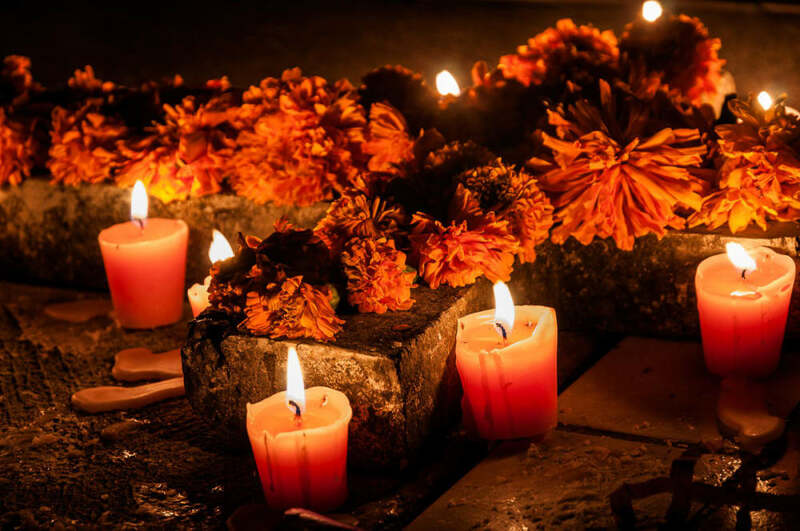 Candles burn next to marigold flowers on the tomb of Rocio Márquez Gurrola on the Night of the Dead in Ajijic, Jalisco. 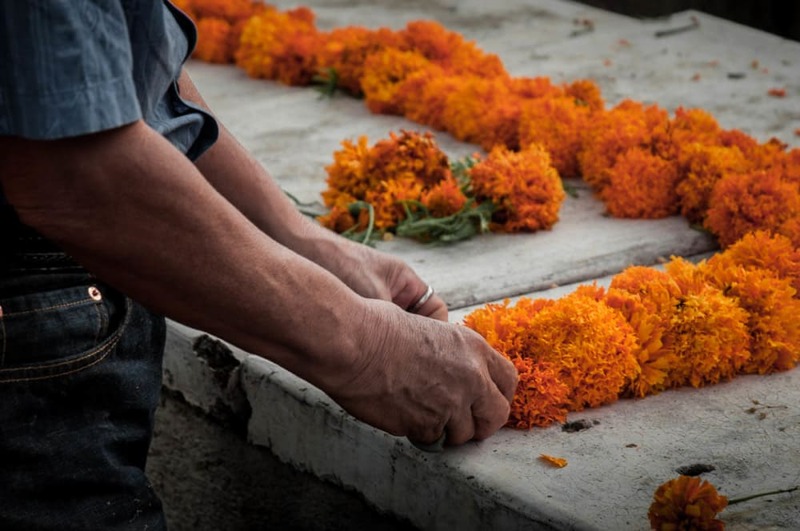 A man carefully arranges marigolds on a tomb on the Day of the Dead in Ajijic, Mexico. 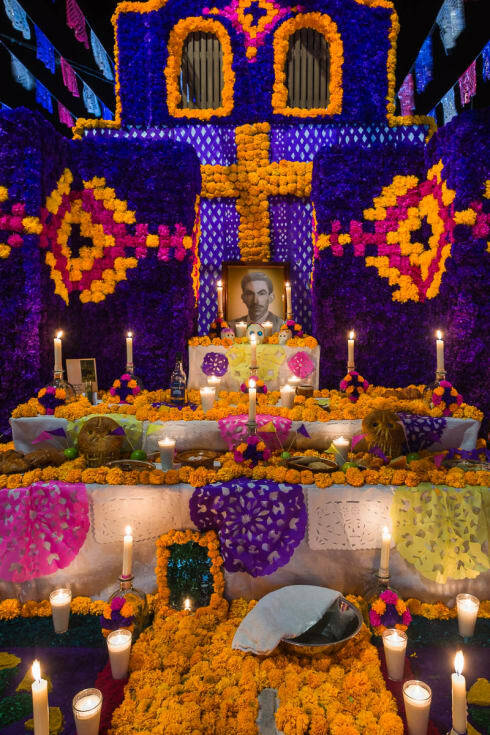 Paper marigolds of various colors provide a backdrop for a Day of the Dead altar in Chapala, Jalisco. 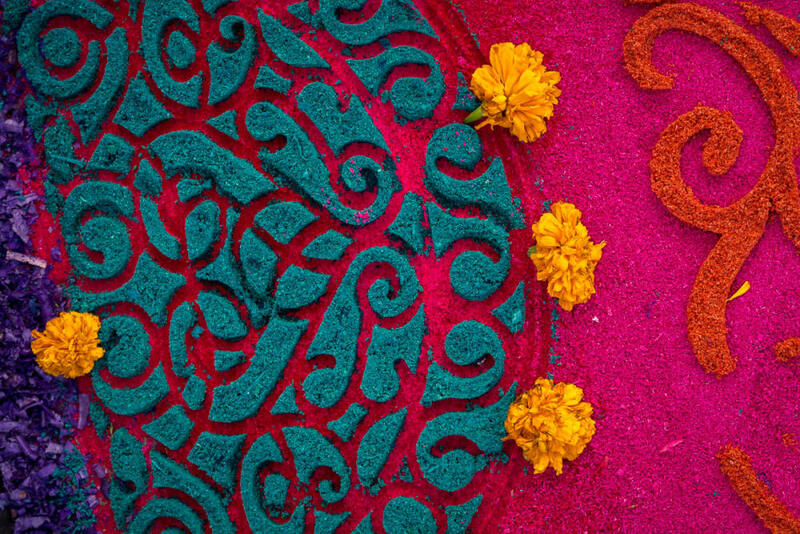 Elaborate, hand-designed patterns of colorful sawdust will sometimes line the entryway of the altar, serving as a path for the dead. These colorful, patterned carpets of dyed wood shavings called tapetes de aserrín can span the length of a block in some elaborate cases, and take a dedicated team of a dozen or more people the afternoon to create. 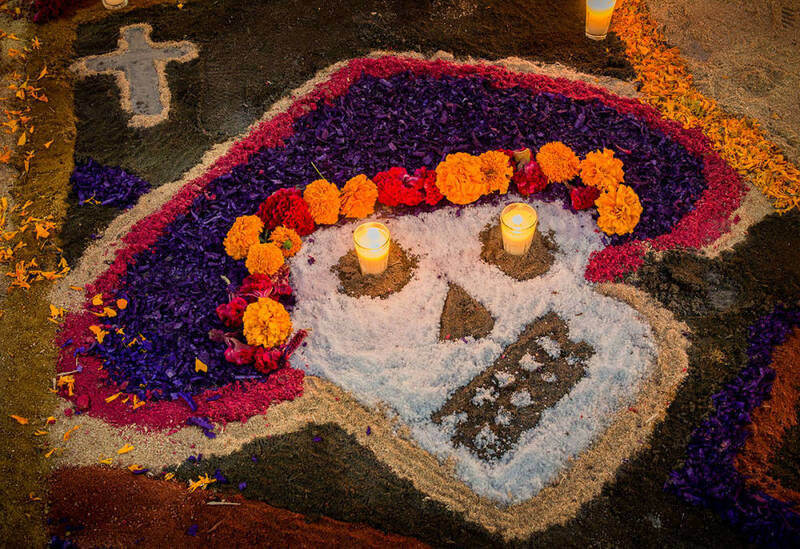 The tradition arrived in the New World with the Spanish conquistadors, and today is still upheld in Mexico and Central America, especially for the Day of the Dead celebrations in Central Mexico. People construct an altar with a tapete in the plaza of Ajijic, Jalisco, Mexico. Tapetes de aserrín (sawdust carpets) take hours to create from planning and design to execution on November 2. Wooden molds are sometimes used to create the intricate sawdust carpet designs. 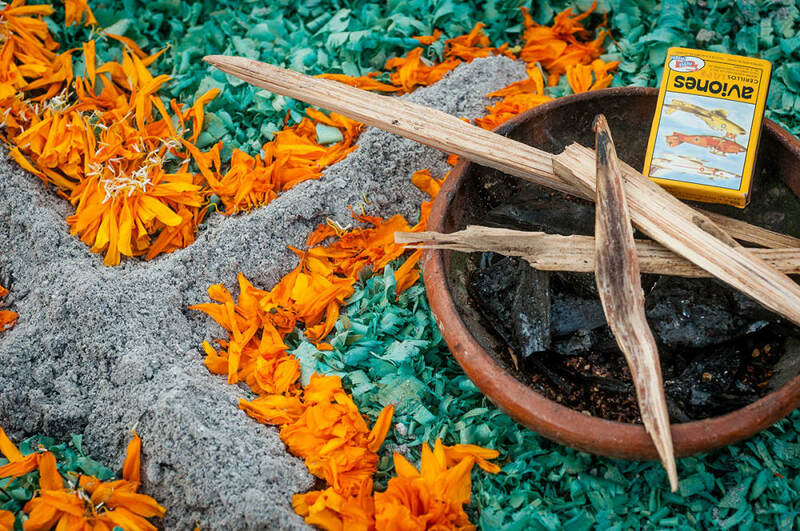 Copal resin is burned to purify the souls of the spirits and to elevate the prayers of friends and family to God. A bowl of incense waits to be lit on el Día de los Muertos in Chapala, Mexico. Incense burns on the floor of an altar in Chapala, Jalisco, Mexico. Sticks of copal incense sit in a bowl on the afternoon of November 2, 2017, in Chapala, Jalisco, Mexico. Incense burns in a clay burner in Ixtlahuacán de los Membrillos, Jalisco. Salt acts to cleanse the spirits and purify their souls during the following year. Salt, marigold, and colored sawdust have been arranged to form the classic 1910 image of the La Catrina. La Catrina has been an essential element of the Day of the Dead ever since printmaker José Guadalupe Posada made his etching La Calavera Catrina in 1910. His image of an elegantly dressed catrina is not only an iconic part of the Day of the Dead, but also recognized worldwide as an emblematic symbol of Mexico. If you like the catrinas, you might enjoy this series of photos of catrinas on the Day of the Dead. 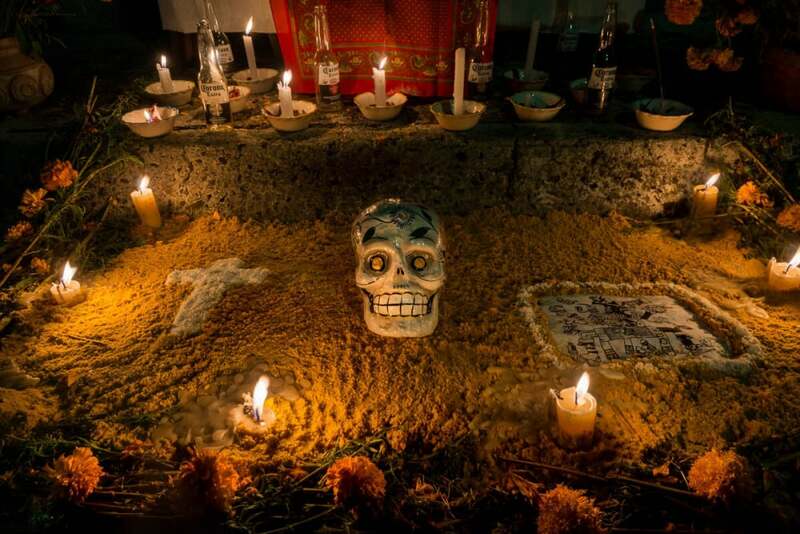 The “Day” of the Dead really spans three days and nights, starting October 31. This altar had been decorated for Children’s Day, which takes place November 1. It’s said the children are eager to run back to their families, so they arrive the night before the adults do on November 2. The catrina image, designed with seeds and dyed sawdust at an ofrenda for José Guadalupe Posadas, who is credited with coming up with the original catrina image over a century ago. Catrinas adorn a Día de Muertos altar for family and friends in Ajijic, Jalisco, Mexico. These perforated designs are sometimes made from plastic, but the traditional ones are still hand-cut in tissue paper, making it a recognized Mexican folk art. 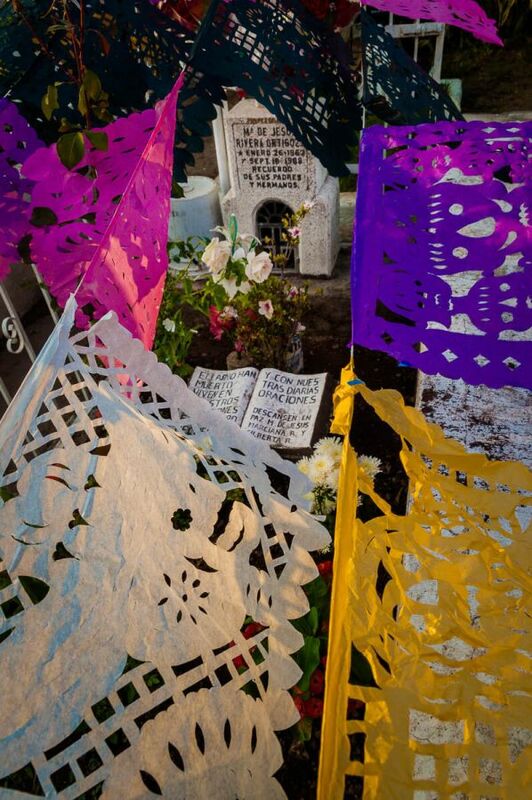 Hand-cut papel picado hangs above a grave in the graveyard in Ajijic, Mexico, on the Day of the Dead. 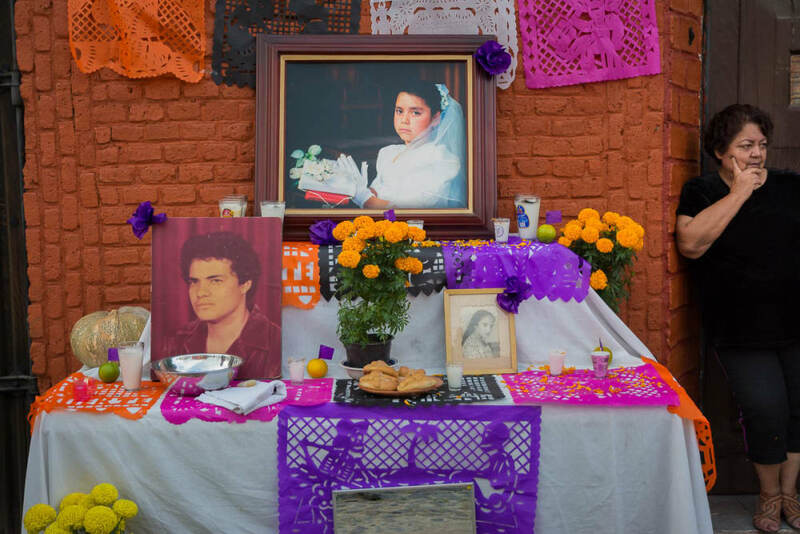 Papel picado, interspersed with photocopies of family photos, hangs over a tomb in the graveyard in Chapala, Jalisco, Mexico. 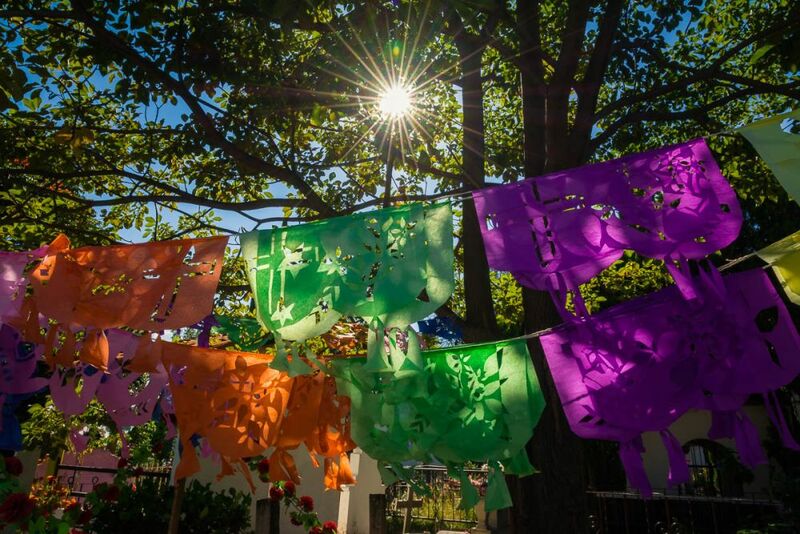 Strands of papel picado seem to defy gravity and hover above graves in the descending sunlight of the early autumn evening. Musicians will wander the graveyard November 2 and families can hire them while everyone is gathered around the tomb celebrating. Sometimes a radio might play the favorite songs of the dead. Norteño musicians play some songs for a family in mourning during the Day of the Dead in Chapala, Jalisco, Mexico. This type of sweet bread is only sold in the weeks leading up to the Día de Muertos. It’s eaten by the living, as well as left as an offering on the altar for the returning dead. Pan de muertos is one of the most important elements of an ofrenda, with a long history extending to prehispanic times. Aztecs, during their sacrifice rituals, would cut the still-beating heart from the chests of the sacrificed. The Spanish, of course, aimed to put a stop to this non-Christian behavior when they arrived to conquer Mexico at the beginning of the 16th century. They forced the substitution of bread for the heart, shaped in the form of a corazón and painted in a glaze of red sugar. 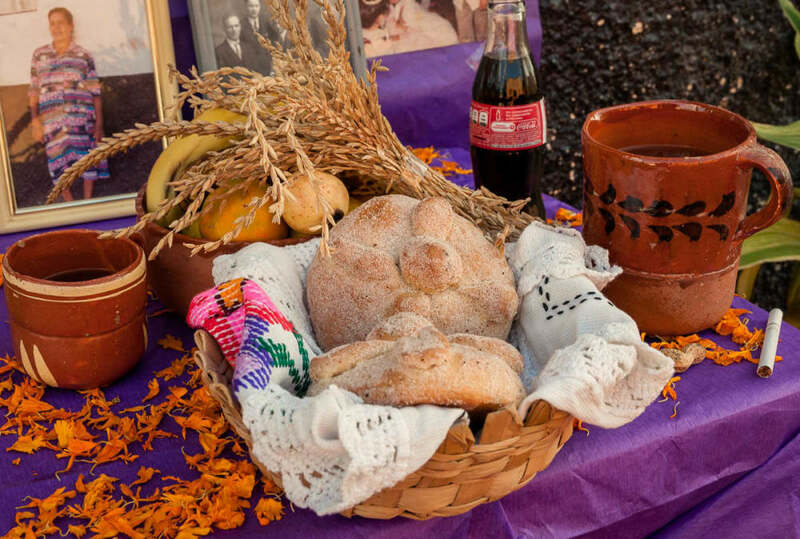 This is the origin of today’s pan de muertos, which has regional variants across Mexico. The Spanish, of course, aimed to put a stop to this non-Christian behavior when they arrived to conquer Mexico at the beginning of the 16th century. They forced the substitution of bread for the heart, shaped in the form of a corazón and painted in a glaze of red sugar. This is the origin of today’s pan de muertos, which has regional variants across Mexico. Pan de muertos, bread of the dead, is offered on an altar along with grains, fruits, beverages, marigolds, fruits and a cigarette. Pan de muertos on an ofrenda in Ixtlahuacán de los Membrillos, Jalisco. 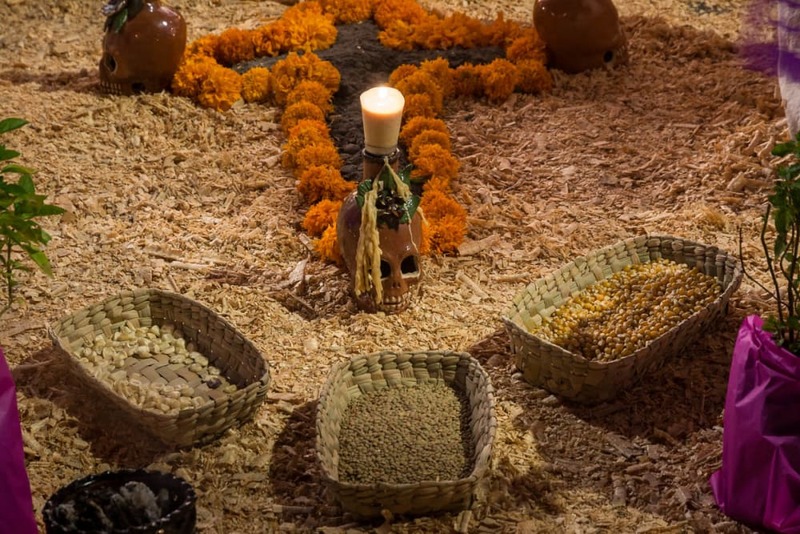 Representing the element of earth, seeds or grains are left out in bowls or combined with the dyed sawdust to create designs on the floor of the altar’s entrance. An altar with seeds, bread, garlic, chiles and other offerings in Ixtlahucán de los Membrillos, Jalisco. 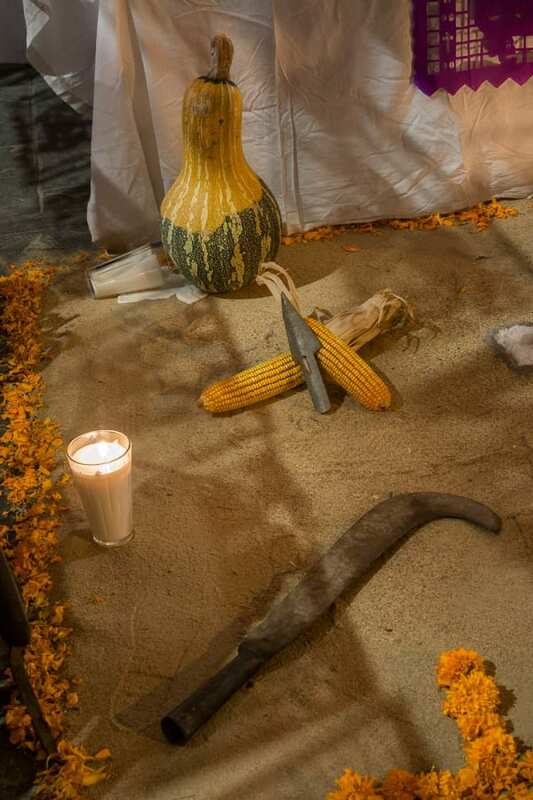 Lentils, corn for pozole, and popping corn are among the seeds and grains left at a Day of the Dead altar in Mexico. Seeds and colored sawdust were used to create this image of Mexican accordionist Lupe Tijerina. 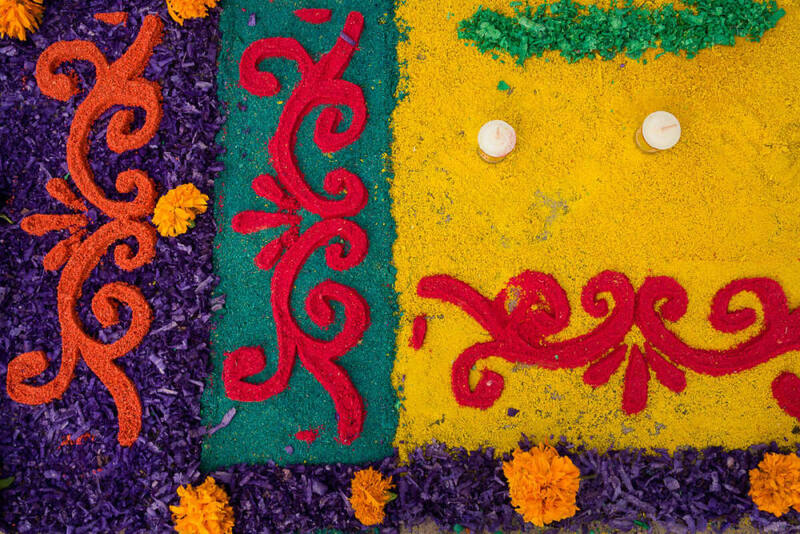 Beans, corn husks and a marigold flower create a design at an altar in Chapala, Jalisco, Mexico. A white cross today comes from Christianity, but it used to signify the four cardinal directions. 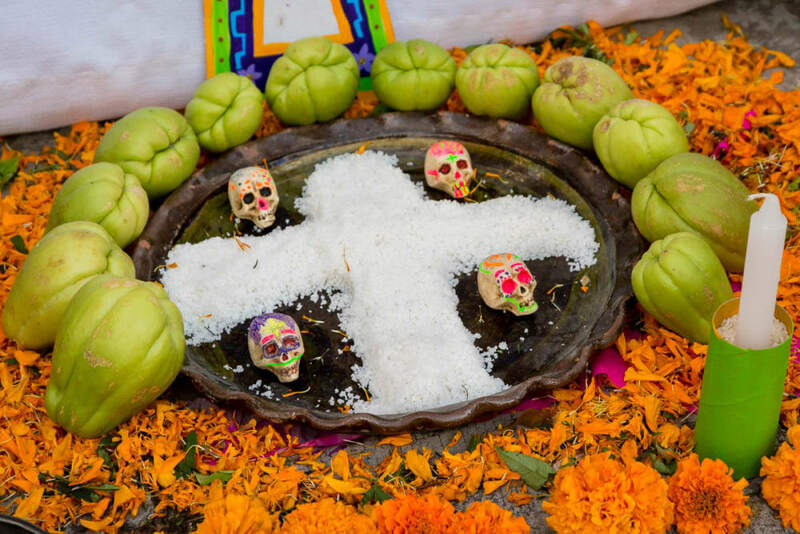 The altar has evolved through the centuries, as the Catholic overseers of post-conquest Mexico incorporated indigenous ideas into its Allhallowtide triduum. Sometimes other colors, such as black and grey, are added. Charcoal, ash, and salt were used to make these crosses at the entrance of a Day of the Dead ofrenda in Chapala, Jalisco, Mexico. A grey cross made from ash at an altar on the Day of the Dead in Chapala, Jalisco, Mexico. A cross made from salt in Chapala, Jalisco, Mexico. Footballs, playing cards, cigarettes, toys, books or anything that was significant to the dead might be placed on the altar, including professional items from the deceased’s life, such as these field tools. A man’s tools left on his altar in Ixtlahuacán de los Membrillos, Jalisco. Even the dead need walking shoes, and a pair of comfortable (or uncomfortable…) shoes are sometimes left for the dead to step into while they’re temporarily back in the land of the living. 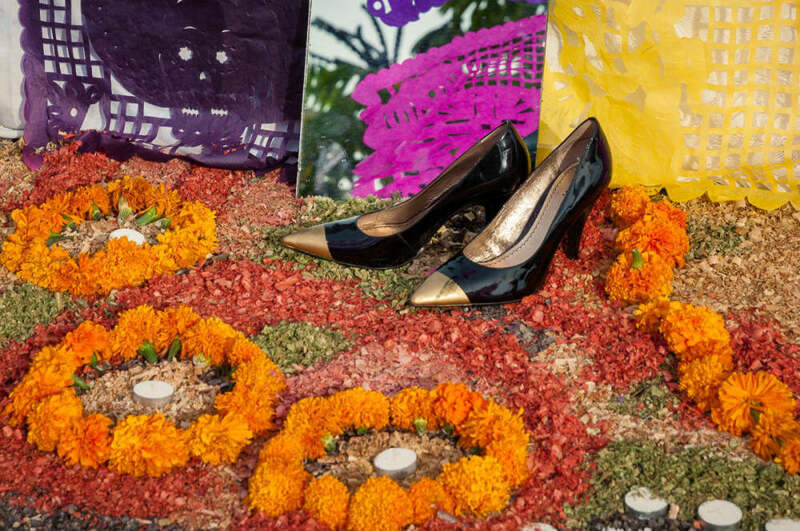 A pair of heels awaits the return of the deceased on the Day of the Dead in Chapala, Mexico. Shows sit on an altar below an offering of a plate of fried fish at an altar in Chapala, Jalisco, Mexico. A favorite set of clothes might be left out for the deceased visitors, so they have something familiar to don upon their return. 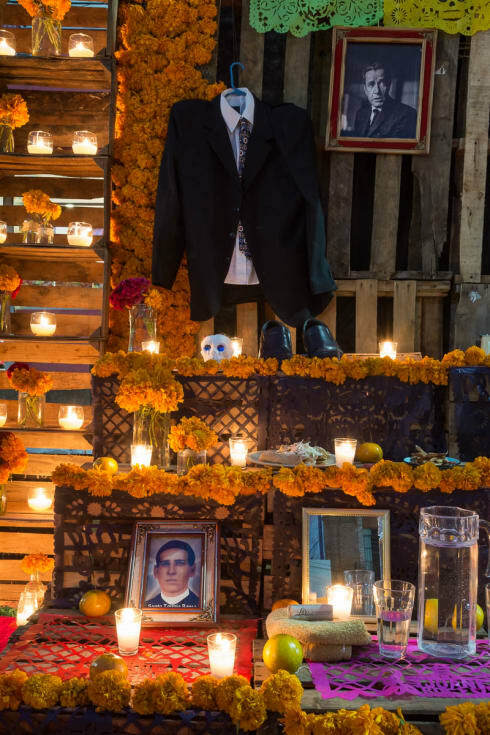 Clothes of one of the deceased were put onto a mannequin in this altar in Chapala, Jalisco. “We’ll always remember them,” says the sign. A football jersey with the Virgin Mary on an altar in Ixtlahucán de los Membrillos, Jalisco. The soap, a basin of water and the towel help the spirits of the dead bathe and keep clean while they are back on earth. Pitchers of water are also left so the spirits can quench their thirst after a presumably long journey back home from the afterlife. Soap, a basin of water, a towel and a mirror await the dead for their brief visit back from the afterlife on el Día de Muertos. Family and friends will leave these and other objects on an altar so that the dead will be able to freshen up and feel comfortable during their stay. An altar might have a mirror to help the dead check their appearance after washing and freshening up. 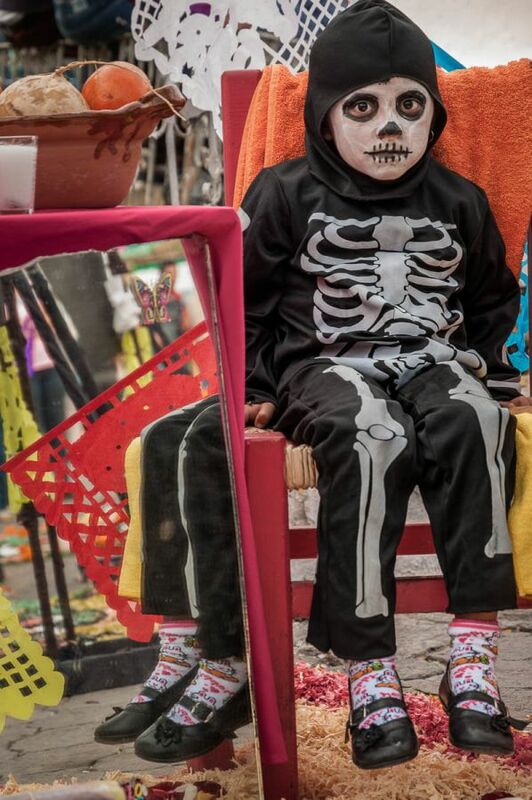 A girl dressed as a catrina sits beside a mirror at an altar in Chapala, Jalisco. 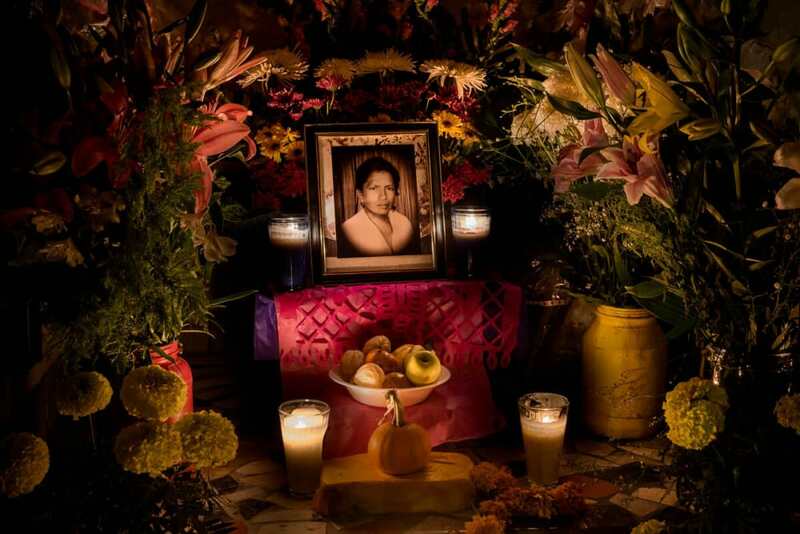 A mirror on an ofrenda in Chapala, Jalisco, Mexico. These woven mats made from tule reeds were once commonly used for sleeping. On the Day of the Dead, they are sometimes put out so the spirits have a place to sleep. 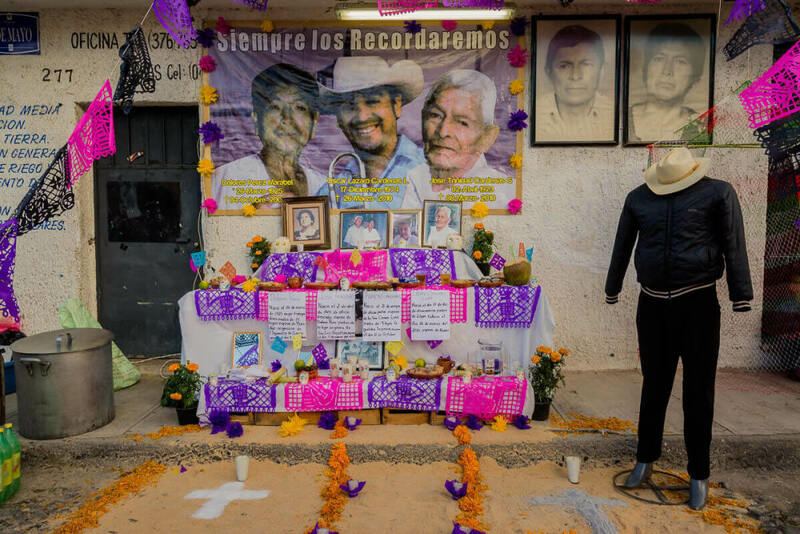 Skulls sit on top of a petate sleeping mat (center, bottom) at this altar for the 43 missing students from the Ayotzinapa Rural Teachers’ College. Leaving out a plate of favorite food is one of the many personal ways of remembering the dead. 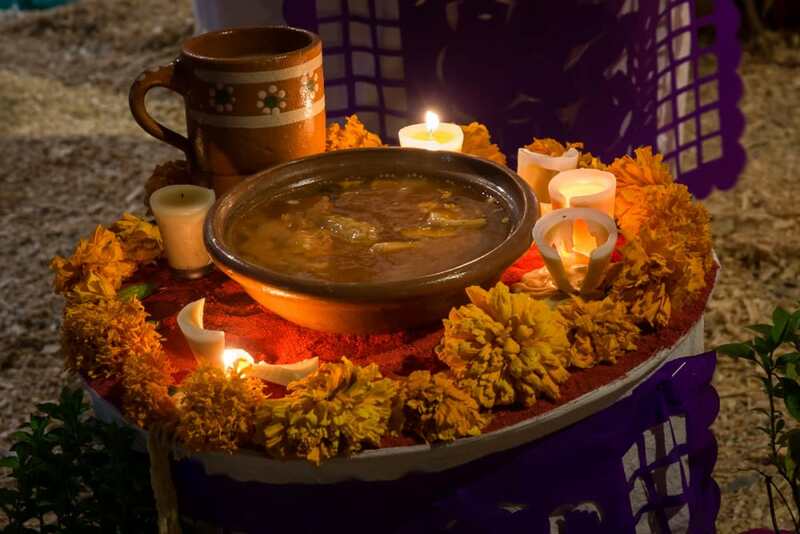 Marigolds and candles line a bowl of soup which has been placed at a Day of the Dead altar on the “noche de muertos,” November 2, in Ixtlahuacán de los Membrillos, Jalisco. 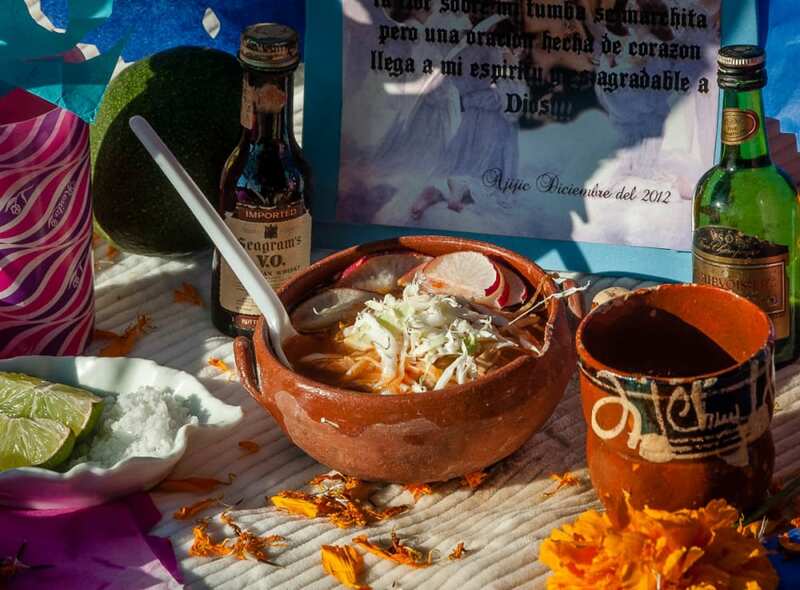 A bowl of pozole finds a home among some spirits of the earthly dimension on a Day of the Dead altar in Ajijic, Jalisco, Mexico. The dead’s favorite drink is laid out: a bottle of tequila or beer, or perhaps a cup of pulque. Non-alcoholic drinks are also offered such as atole, which is a hot drink made from masa and water. 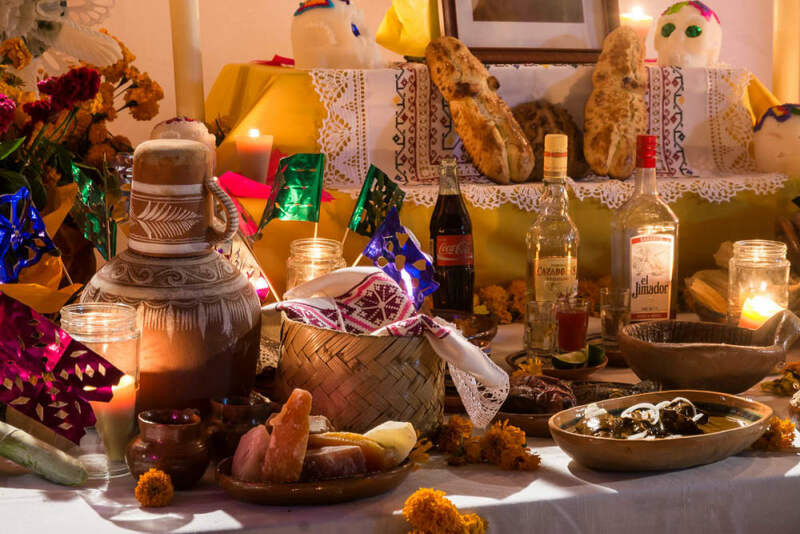 Bottles of Tequila Cazadores and El Jimador tequilas were left on this altar in Ixtlahuacán de los Membrillos, Jalisco, along with candied fruits and vegetables, plates of food, water, bread, sugar skulls and many other common Day of the Dead altar elements. Azul Tequila on an ofrenda in Ixtlahuacán de los Membrillos, Jalisco, Mexico. 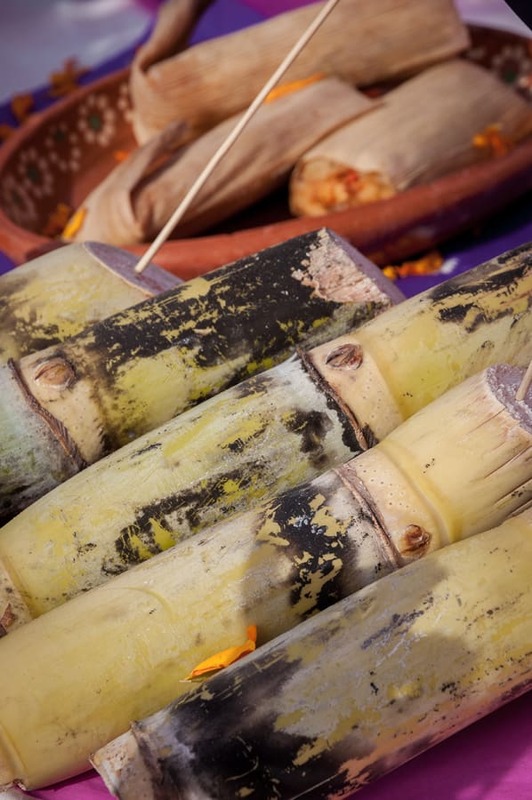 Long stalks of sugarcane can be tied together into an arch over the altar or put out as offerings. Sugarcane on an ofrenda in Chapala, Jalisco, Mexico. Also left out are fruits and vegetables, along with plates of rice, beans, mole or other traditional foods. Chayotes ring a platter of salt which has been formed into a cross. Chayotes are a popular squash in central and southern Mexico which are cheap and abundant. 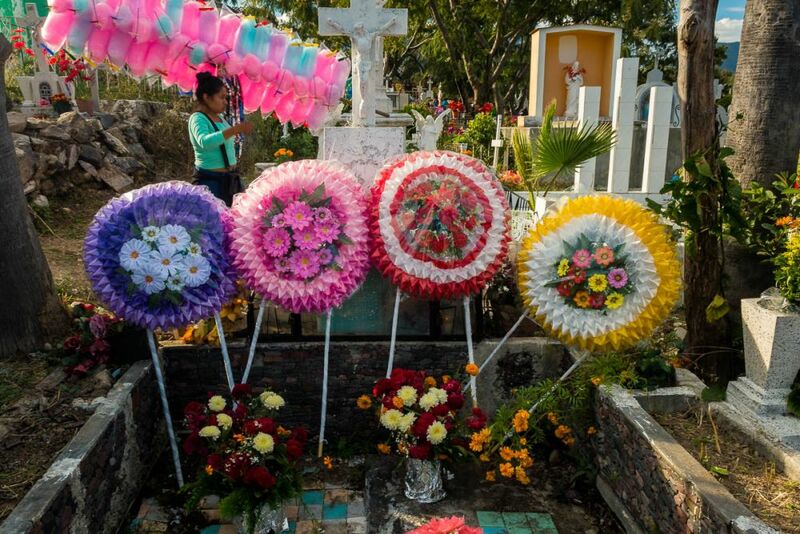 Coronas de flores, or crowns of flowers, are often placed on graves after a burial, with new coronas being purchased each Day of the Dead to replace the old ones. Kids read on an October afternoon in a doorway next to coronas for sale in Ajijic, Jalisco. 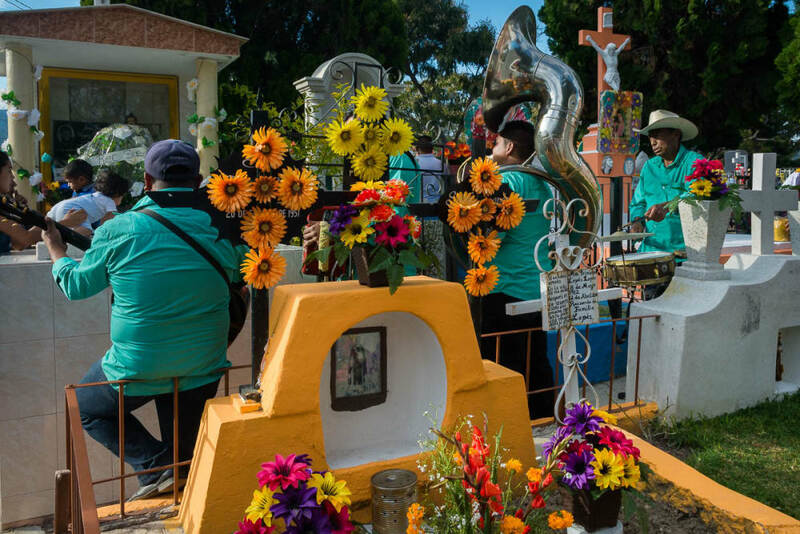 Four coronas are on a tomb as a woman selling cotton candy passes by on the Day of the Dead in Chapala, Jalisco. Finally, one of the most important items at the altar is a photo of the departed, placed on the uppermost level of the altar, usually among images of saints, Jesus and the Virgin Mary. A woman stands beside a Día de los Muertos altar, her familial resemblance to the portraits quite notable. Chapala, Jalisco. A photo of the deceased on the Night of the Dead in the cemetery in Ajijic, Jalisco, Mexico. The metate, made from volcanic rock, has been used for centuries to grind corn into masa for tortillas, sopes, huaraches, and dozens of other variations. A metate, used for making masa for tortillas. A metate in Ixtlahuacán de los Membrillos, Jalisco. 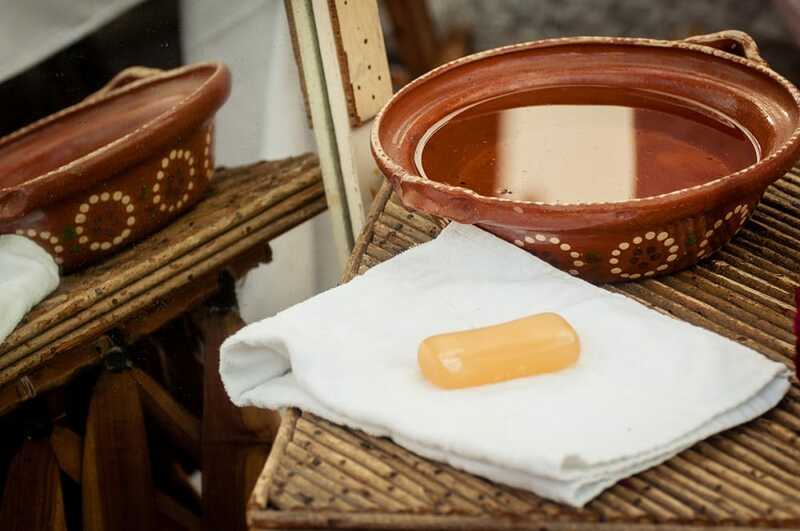 A metate sits next to a cross, a bowl of water with soap and cloth, and a mirror. This popular children’s game is played during parties and is a party of everyone’s childhood, finding its way into jokes and, in 2018, into Ajijic’s New Year’s parade. A set of lotería mexicana cards sits on the floor of an altar for the Day of the Dead in Ixtlahucán de los Membrillos, Jalisco, Mexico. These cardboard dolls, known as muñecas de cartón and muñecas lupitas were a common toy for girls before the influx of cheap plastic products from China. A muñeca de cartón on a Volkswagen Beetle that has been converted into a Day of the Dead altar in Ajijic, Jalisco, Mexico.